An experiential training defining the key elements of shamanism! Shamanism has been deemed “the mother of all healing modalities and religious systems”. It is an ancient, worldwide phenomenon that has been practiced by every culture throughout history. An examination of today’s healing and spiritual systems will reveal that these methods have emerged through the explorations, expanded consciousness and compassionate heart of the shaman. Our indigenous ancestors realized that to heal spiritually, was to make whole. Through personal spiritual healing, one could help others heal and become more spiritually attuned. The shaman of a village was that person who was adept at working in the spiritual realms and who would bring help from spirit allies to ease suffering. To our ancestors, the entire universe was sacred and alive. Our sacred Earth possesses every kind of life, both organic and inorganic; if everything is alive, then all of life has a spirit. The shaman’s role is to understand the universal webbing which is the connecting source of all of life, and to help heal the individual, group and/or planet with this special knowledge. The Roots of Shamanism is presented in five modules and initiates participants into the four primary aspects of shamanism. These are Divination, Extraction Healing, Soul Retrieval and Psychopomp. Through knowledge and experience of these areas, life becomes sacred, expanded and powerful; one becomes humbled, awed and companioned. With this sacred knowledge, you should never feel at a loss in helping yourself or others. We open our shamanic training by delving into our past to discover our ancestral beginnings. An overview of shamanic history and sacred practices preparing us to begin our personal journey into an internal awakening of potentialities. There is an old saying that “all shamans are healers but few healers are shamans”. We will learn what separates shamans from other types of healers — the unique and specifically performed technique which allows one to enter into a state of awareness known as the “awakened dream”, or, more commonly, the shamanic journey. Much of this first sessions will be spent exploring the Art of Divination, very precise methods for communicating and interacting with the beings of the spiritual realms. Divination provides for an essential relationship and rapport with the spirits. It is both foundational and fundamental to all shamanic practices and shamanic work rests upon one’s knowledge and expertise in this area. 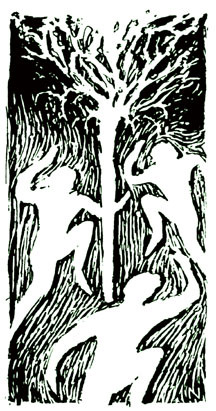 For this reason, The Center Pole offers an extended, five part training called The Roots of Divination. Because the Earth is alive and teeming with spirits, a shaman attributes the primary cause of illness to be “misplaced” spirits. Through divination, the shaman assesses the spiritual condition of their client and performs “extraction healing”, a technique which removes the offenders and returns them to their proper environment where they are able to continue their existence. Extraction is not the only healing method employed by shamans, however it is one of their fundamental practices, since it is believed that no healing can be truly successful if intrusive energies are not removed. Indigenous cultures understood that traumatic life experiences which cause intense pain, fear and/or grief can cause parts of the soul to leave and find solace in the expanded spiritual dimensions. This fragmentation separates us from an essential source of our life force, leaving one feeling powerless, vulnerable and open to unwanted spiritual intrusions. Through the shamanic journey, the shaman counsels and escorts these soul parts back to the individual, enabling them to become re-spirited and powerful once again. This process is known as ”soul retrieval”. A person must have a calling to perform this type of work. It is not mere “visualization”. When done properly, it calls upon the practitioner to be as vulnerable and open as the client. This is why the shaman is referred to as the “tender hearted”, for they cannot help but to help. Shamans have traditionally worked with people in the dying process to help release them from their attachments on earth and prepare them for their journey to the dimensions of the afterlife. During this training, we will learn to compassionately assist people in detaching from physical life so that their dying process becomes a more accepted and natural experience rather than a fearful and or regretful one. We will also learn how to sort the confusion of discarnate souls who may be stuck in their death transition due to fear, lack of spiritual conviction and the resultant attachments to the material plane. The shaman escorts these lost souls to the proper spiritual dimensions in order that they may continue their path on the spiritual plane. The shaman becomes a Psychopomp, helping to “conduct” (pomp) the “soul”(psyche) home. Once the individual is equipped with personal spiritual experience and subsequent specific spiritual knowledge, they are ready to begin the path of the shaman. The final sessions review all that was taught and shows how to conduct an actual shaman ichealing ritual. A shamanic healing is more like a ceremony that flows effortlessly from the heart of the shaman through their spirit helpers into the client to either remove intrusions, install soul parts or power and or lead spirits into or out of the physical realm. Upon completion of this training, individuals will have sufficient knowledge to work with family and friends and to begin communicating with an expanded, organically-spirited world.